Sure everyone who has tried to use expect-lite knows it is easy to use if you are just using > and < in the script. But what if you want to do something a bit more tricky, say capture a value from the screen, and make a comparison. It is a bit contrived, but say for example, you want to check the number of packets received on the eth0 interface is below 100,000 (100 thousand). In expect-lite, it is quite easy to do the comparison using a dynamic variable, a variable which is assigned based on the output of a command at run time. Sometimes it can be tricky to get the regex right to capture the info you want, but I will keep regex simple, and use copy and paste to solve this puzzle. I prefer overlapping windows, but it is up to your preference. 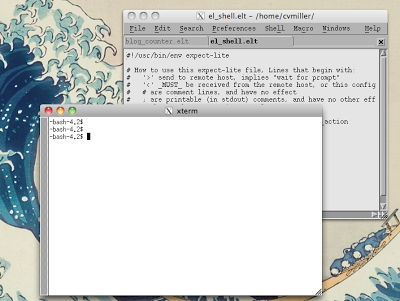 The key is that you start an editor (I use nedit) and a terminal (or xterm) and can see them both at the same time. In this exercise, we will write lines of expect-lite code in the editor, copy them, then paste them into the terminal which is running el_shell.elt. Having overlapping windows (rather than full screen) makes it easier to see what is going on. Even though the scriptlet failed, el_shell.elt is still running. This is because while in the debugger, one has immunity from failing. After all, it would not be helpful if the debugger quit just because you pasted in some code that failed. As you can see copying and pasting into the debugger allows you to run arbitrary expect-lite code, and see the results instantly. The debugger is not limited to simple commands, you can paste while loops, directives (like *DEBUG), include files, or other complex code and have it execute right away. The mantra of expect-lite is keeping it simple. What could be simpler than copy and pasting scriptlets while you automate complex solutions. PPPS. In Linux/Unix/Mac you need not actually copy and paste, since X has an automatic clipboard, by just selecting the text in the editor, moving the mouse to the terminal and pressing the middle button on the mouse (which will paste the selected text). This makes the overlapping window setup very fast. PPPPS. the debugger does have a restriction on copy and paste, the first line must not be indented (lines below the first line can be indented).